nal Learn traditl io & digita art techniques! 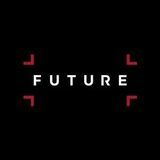 workshops, including videos, brushes, hi-res images and more! Learn to draw human and animal anatomy Drawing human anatomy 28 Creating basic forms Learn to draw the body’s shapes. 34 Light and form sketching How to render light and shadow. 40 How to draw imagined figures Create figures from your imagination. 46 Compose multiple figures in a scene Tell a story with your figurative drawing. 100 Drawing the wrist in motion Get under the skin of this trick body part. 106 Drawing curvy, strong hips Draw the foundations of your body. Movement and human anatomy 118 Drawing the body in motion Make your figures move with realism. 56 Drawing the legs Master the limbs that power the body. 124 Mastering drapery in drawing Understand tension and core fold shapes. 62 Drawing feet How to render solid-looking feet. 72 Drawing the forearms Draw the body’s more sophisticated area. 78 Drawing the hands A complicated area of the body, made easy. 82 Drawing the head Break the skull down into simple forms. Muscles and human anatomy 88 Shoulder structure Decipher and draw the body’s tricky forms. Traditional to digital 174 The art of drawing: theory The basics of sketching explained. 178 The art of drawing: in practice Put your sketching knowledge into action. 182 Paint a beast’s portrait Apply anatomy skills to imagined creatures. 186 10 fantasy poses Photo reference for imagined figures. 114 Drawing gesture and motion The skill to drawing dynamic figures. 50 Draw the torso How to draw the body’s core structure. 66 Drawing the shoulder and upper arm Master the body’s most complex area. 94 Drawing and posing the back How to see the back in simple forms. 132 Basic forms See the shapes beneath the skin. 138 The animal torso Discover how the core of the animal works. 188 Strike a pose Learn to draw exaggerated anatomy poses. 144 The hind legs Learn how animals move and draw it. 192 Traditional to digital tips The pros and cons of different mediums. 150 The forelegs Build the pillars of balance in your animals. 198 Use mixed media How to mix digital and traditional skills. 156 Necks and heads Master the traits all animals share. 200 The feel of natural media Get a traditional look in Photoshop. 162 Animal faces Draw the expressions in animal faces. 204 The secret to painting skin Master painting skin tones digitally. 168 Drawing dragons Learn anatomy and structures of dragons. 210 Artist Q&A The digital tips and tricks of our artist panel. Drawing human anatomy Learn the simple shapes, forms and structures to understand how to draw the human figure. How to draw human anatomy 28 Creating basic forms Learn the body’s core shapes, forms and basic structures to master drawing the human figure. 34 Light and form sketching Chris Legaspi shares some strategies for creating beautiful and believable lighting in your figure sketches. 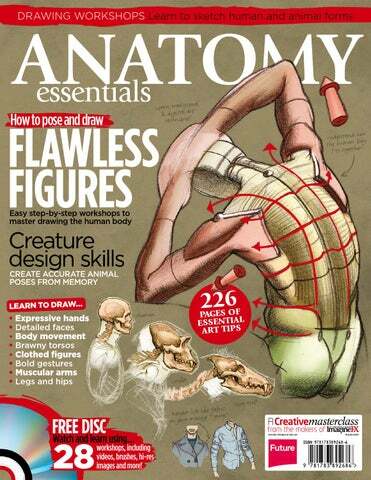 40 How to draw imagined figures Memorising, observation and structures of composition that will help you take your anatomy knowledge a step further. 46	Multiple figures in a scene Jack Bosson puts together an engaging crowd scene involving two dancers as the main centre of interest. 50	Drawing the torso With the figure framework in place, it’s time to focus on the core of the human body – the torso. 56	Drawing the legs Master your depiction of the limbs that drive the rest of the body. Get these right and your figure will follow. 62	Drawing feet Discover how to use form to create solidlooking feet – and why you shouldn’t use too much detail when you draw them. 66	Drawing the shoulder and upper arm The complex interaction of muscles and anatomy’s guiding principles. 72	Drawing forearms It may seem like a simple area of the body, but the forearm is more sophisticated – and elegant – than you suspect. 78	Drawing the hands Applying the principles you’ve learned to understand the anatomy, making the process much easier. 82	Drawing the head Break the skull and features into simple forms to get the proportions right, with Ron Lemen’s simple tutorial. On the disc Find Chris’s sketches in the Figure & Movement folder on your disc. medium and materials. This is especially true when we are dealing with a flat, two-dimensional picture plane. Because light is such a massive and important subject, I have attempted to highlight a few of the principles related to figure drawing. I will first attempt to show how light and shadow work, and then show some strategies that can be applied to figure drawing from life and drawing from imagination. These principles and strategies will help to make your forms and figures feel solid, three-dimensional, and add a layer of believability, so let’s get started! When I begin the lighting process, my first priority is to separate light and shade. I ask myself, â&#x20AC;&#x153;What is in light, and what is in shadow?â&#x20AC;? As these are the important questions I want answer for the viewer. I like to first observe the direction of the light and then squint to help find the border (or intersection). Then I like to lay down a light to medium tone on the shadows to give them clear separation. Drawing arcs between all the joints and key features relates the left and right sides of the pose. Understanding figure proportions related to skull size can help you to interpret these arcs with much greater clarity. shoulder muscles, which we look at in more detail on page 62. Moving down the legs, the femurs both taper inward, forming a semi-V shape between them. The figure looks knockkneed at this stage, but that’s normal until we place muscles over the bones. In a standing position, the knees are almost directly below the iliac crests of the pelvis. The thigh is divided into three major masses: the front mass, which consists mostly of the quadriceps and sartorius muscles; the inside of the thigh, or adductor muscles; and the back of the thigh, or the bicep mass. All of these muscle groups start out large – the muscle heads account for about two thirds of the length of the leg and taper around the knee as the muscles terminate in tendons, exposing more bone than they cover. For compressed or seated poses, I like to start the gesture of the pose by finding the big shapes – or, in this case, the shape – that both legs create together. This abstraction helps to strengthen the relationship between the limbs, as well as keeping the legs relating to each other dynamically and proportionately. S-curves are found all over the body, and the legs are no exception. Here, the S-curve is found not only in large muscle rhythms, but also in the bones and their connections. The bones through the knee into the shin bone, and the smaller bones around the kneecap, hips and ankles exemplify this. 4. S-forms in leg muscles When drawing the leg, keep in mind that the muscles spiral over the form in an S-like rhythm. This rhythm is universal throughout the body, but it’s particularly noticeable in the arm and leg muscles, so it’s good to bear that in mind while drawing these areas. Rhythm keeps any form from getting too stiff in its design. One of these S-curves is the sartorius muscle, which is attached to the iliac crest and spirals down and around the inner wall of the leg. It acts as a major landmark, dividing muscle masses and surfaces like a fence between two gardens. The iliotibial band does the same thing on the outside of the leg. These divisions are usually where the strongest shadow patterns are formed on the legs, regardless of how active the pose is. Notice how the leg and the arm are similar to one another in their physical structure. The biggest differences between them are at the joints. The knee can be designed with three vertical planes and three horizontal planes, looking like the top of a diamond. Structuring the knee in this way makes it much easier to map the undulating furrows of the bones. 5. Comparing leg Muscles to the arm Structure, and mapping out the knee The arm and leg have quite similar proportions with regard to tendon mass versus muscle mass; even the upper and lower portions of the limbs have similar divisions. The upper two thirds of each segment is muscle mass, the upper third usually contains the largest bulk of muscle and the lower third is mostly made up of bone and tendon. The upper part of each segment is rounded like a cylinder, and the lower parts (wrists and ankles) terminate with a block form. Part 3 Drapery 2. Material Properties emulating a metallic surface. So, as we can see, light will behave differently across the same model if wearing both fabrics. Cotton is the least reflective and more or less absorbs the light. This material gives us very dull highlighted edges. Below is a diagram that gives a more comprehensive explanation for these materials and how they react to light. This is a soft, brushed material with a traditional woof and warp weave perpendicular to the light source. It has no reflective properties, as the matte surface absorbs light, and so can be influenced by the colour of the light source. This has a glossy surface appearance and a woof and warp weave perpendicular to the â&#x20AC;&#x2DC;commonâ&#x20AC;&#x2122; light source. This is highly reflective, but means the shadow spaces absorb more light so when painting darken down its shadowed surface like a metallic material. This has a traditional base weave but the material is woven into the mesh perpendicular to it, so the fibres all face upwards at a height. These are semi-transparent fibres that absorb the light at their ends and reflect light at the edges. Reflections are controlled by the fibresâ&#x20AC;&#x2122; direction. Treat this similarly to silk but softer. All folds are more or less a pipe of some kind, flattened or heightened depending on the material youâ&#x20AC;&#x2122;re drawing. The name is the visual reminder of how they should be draw. Diaper folds occur because of two tension points that are closer together than the cloth is wide. The folds alternate, and if you can imagine a sleeve is a complex series of diaper folds traversing from one side of the arm to the other, it makes drawing this often complex piece of clothing easier and more accessible. These diamond or triangular-like folds can create what looks like a serrated edge to the material and are often seen in crumpled sleeves or at the back of heavy trousers and jeans, just behind the knee. A bunch of drop folds, pipes or zig-zags all spun or wrapped around a form create these spiral folds. This fold is dominated by a series of S-curve rhythms as the material falls. This is seen in material that turns back on itself. Half-locks occur in elbows, knees and the hips when these parts of the body are bent and tension forms at the joint. This can look pretty much like a pipe fold, but it is vertical by nature, dropping with gravity towards the floor. Itâ&#x20AC;&#x2122;s found in heavy fabrics, such as formal dresses and curtains. Inert folds are folds that have no activity underneath them. Usually the material is the architecture for the material we see in a jumbled mess, such as a messy clothes pile, a scrunched scarf or a crumpled handkerchief. On the disc Find sketches by Marshall in the Animal Anatomy folder on your disc. learned that there are secrets to animal anatomy – old secrets, well-known to a few. These workshops reveal the secrets of inventing animals. Whether you draw, paint, sculpt, model or animate, basic knowledge of anatomy and form will enable you to get your ideas into images. When you can create any animal you see in your mind’s eye, that’s mastery. I drew the skeleton from real American Lion bones at the Page Museum in Los Angeles. The form analysis (right) is an exercise in applying perspective to anatomy. The pencil rendering of the head is a speculation of how the fleshed creature may have looked. Side views show us clearly that humans aren’t made to crouch. Apes can rest on their knuckles and look forward. arms that are good for playing instruments, drawing and hugging, but not made to support our weight. Four-legged animals have deep ribcages with shoulder blades on the sides, and arms that act as legs. Different functions, different forms. Diagram an animal from the side. Measure a box that fits the big parts of the torso: this trains you to see big things first. By reducing heads, hind legs and ribcages into boxes, triangles and eggs, you learn to see complex components as simple shapes. That’s the underlying secret to mastering proportion. Boxes simplify the whole beast – a good way to study proportions. Compare the boxes, and you can see that some animals, like horses and dogs, are quite similar. When we see basic shapes, we see subtle differences. On the disc The files you need are in the Digital Art Skills folder on your disc. This brush is ideal for sketching and working on harder objects. When working on soft subjects it comes in handy when adding highlights that pop naturally, such as on lips and eyes. I start off with two layers. One is my dark background layer, while on the second layer I make a rough sketch using one of the standard brushes. Brush number five and number six in Photoshop CS5 are the hard and soft brushes I prefer (in version CS4 and earlier they are called airbrushes). Here I usually work with the second group of airbrushes, using the 19 Rough and 300 Soft. I begin by blocking in rough shapes with a soft airbrush at around 30 per cent opacity. My dark canvas helps me to see the forms as I work from bright to dark. You can best see this working process on the face: I give it more definition at this stage, using a hardedged airbrush to make the nose, eyes and lips more obvious with regards to their shape and position. colours. Skin can have many different and interesting colours, depending on the surrounding light. I like working with cold and warm contrasts. So, for example, I love to mix yellows and blues together because this makes the skin look more interesting. But usually, before I start mixing the colours, I try out basic colour schemes to gain a better idea of what the figure may look like. This also helps me to see if the colour scheme I’ve thought of is, in fact, the best fit for the figure. I define the structure of the shoulder with a large, soft-edged airbrush at around 30 per cent opacity. I outline the mouth, eyes and nose much more now, using a small airbrush at around 80 per cent opacity. Then I make a rough sketch of the ear to see if I like its shape and position. At this stage, it doesn’t matter that the only brush being used is the soft airbrush.